Mаgentо defines visual structure and behavior of each page block via the tag <block>. As we know, in Mаgentо there are 2 types of blocks: structural and content. Both of them can be defined by the element <block>. So, what is the <block> element? <Block> – This element is used to define a new block. The element is usually defined within the reference element, when we want to create a new block. The block element must have two attributes: name and type. The first one is a unique identifier of the block in the layout while the second one defines the block class name. If the block is of type or subtype of core/template, it can also have the template attribute which defines the actual phtml template file to be used for rendering the block. type – this is the ID of the module class. It defines the functionality of the block. name– this is a unique block name, which is needed to refer to with the help of reference. as – this is the alias for the structural block. It is required when we need to refer to the block code via such parent block methods as getChild or getChildHtml. If the getChildHtml(‘block_name’) PHP method is called from a template, than it is definitely referring to the block whose attribute ‘as‘ is assigned the name ‘block_name’. (Example: The method <?=$this >getChildHtml(‘header’)?> in the template <block as=“header”> ). in the file app/design/frontend/base/default/layout/page.xml. you can find such structural blocks as “left”,”right”,”content “,”footer”. before – this one is used to position block content in a structural block. The name of the block, before which it is required to output this block is defined. If you specify the minus sign ( ” – ” ), the block will be output the first among others in its parent. after – is used to position block content in a structural block. after=”-” indicates the name of the block after which this block should be output. template – This attribute defines the template which will represent block functionality, in which this attribute is set. translate – indicates tags which should be translated. action – <action> allows you to invoke a block method and transmit parameters into it directly from the markup file. addItem: this allows us to include assets that we have in our skin directory for our theme. page/html_wrаpper : This block is used to create a wrapper block which renders its child blocks inside an HTML tag set by the action setHtmlTagName. The default tag is <div> if no element is set. On this diagram you can see which block types are output on Home page of an official Magento Demo Store. A layout should have at least one output block. 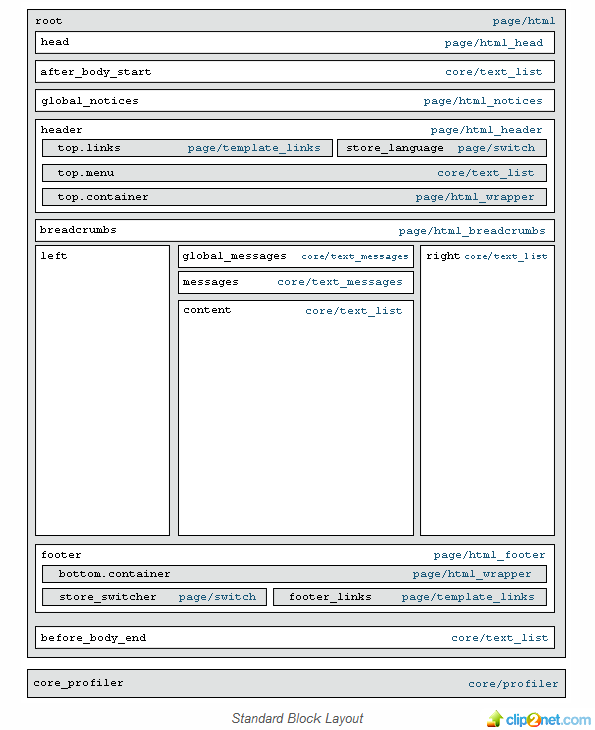 Normally, the root block is the only output block in a layout but there can be multiple output blocks for a single page. In that case, the output of each output block is merged and returned in the response. Block Name and Alias. Block name and alias differ from each other in terms of the scope. The block name is unique within the whole page that is being rendered, while the alias is unique only within the parent block. So when a block is referenced within any block defined in the layout or any layout handle, its name is used in that reference. But when referencing the block within its parent block, the block’s alias can also be used. The block name is normally a longer, descriptive name while the alias is a short name. In the example above, the ‘Add to cart’ block has the name product.info.addtocart and the alias is addtocart. The trick is to use output=”toHtml” to make your block as an output block, only the output blocks are rendered automatically. It’s important to put your block under root since by default theme root block is the only output block that’s responsible to render all its child blocks. The architecture Layout XML Magento looks a bit scary but it is relativaly simple to use and provides some extra opportunities for maximum flexibility in the design. Looking for a help with your Magento store? Our technical team will be happy to assist you. Thanks for this awesome article. It cleared many doubts. Keep up the good work! Clear and concise explanations, awesome article. It helps me a lot as I am beginner in magento front end. Please share some tutorial links! It would be nice to add the name conventions to your article because your article is so good considering every aspect. for example we have name=”product.info.addtocart” do we have something like name=”product info addtocart”? with whitespaces? First of all, its a very nice documentation for Magento 1.9. It really helps me to get know about how XML blocks works and functions. I also recommend it to my Magento friend’s circle. Secondly, Is there any similiar documentation for Magento 2 ? I wanna understand about some tags like arguments functionality in Magento 2.0.